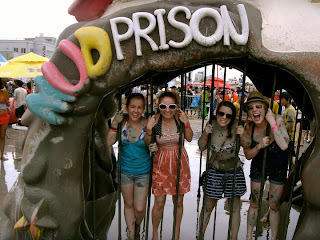 Where can I even begin to describe Mudfest? 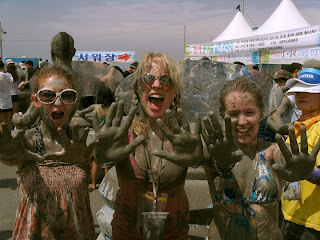 Since before I even arrived in Korea I had been looking forward to this festival devoted to Mud and it didn't disappoint. In fact I would go so far as to say it was better than I even hoped for (which, for something I had built up so much in my head, is amazing)! Our weekend began with the, by now routine, journey into Seoul. After a lovely meal (steak and potatoes...yum) and a few drinks (to get the weekend started) we headed to the jimjilbang for a nights sleep! Bright and early next morning we joined the group of fellow travelers all destined for Boryeong Mud Festival. We had signed up with one particular tour group and so had our return bus costs and accommodation all sorted but roughly 400 other people were also signed with that particular group so that is just a vague estimate of just how many people attend this festival. Apparently on just the weekend I was there there were 800,000 people. Arriving in Boryeong we quickly dropped our belongings off in our pension (accomodation for the night) and made our way as fast as we could to the main area (the slight drizzle at the time couldn't even dampen our spirits)! Arriving at the main area it didn't take much time until we were coated in the grey, smooth mud! To add to the fun the rain even stopped shortly after we arrived! of us as stubborn as the other neither of us would accept defeat and so it ended! The officials in charge called for us to stop as I think they began to understand that there would not be a winner this time! Overall a fitting ending to an even fight! After this we went to eat some lunch and somehow on the way back from lunch Dee and I got separated from everyone else! Considering the mud neither of us had our phones on us and so we were officially on our own. It could have been a disaster wandering through the crowds searching for our friends all day but that is quite different to what happened next. 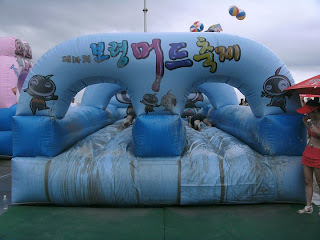 While walking along the beach, in an almost pointless attempt to 'just see' everyone we had lost, we came to a little stand renting inflatable rubber rings for the day for the low low price of 5,000won. Dee and I rented the rings, headed to the shop for some drinks, returned to the beach and floated out into the water! Sounds simple but believe me it wasn't! Dee's upper body strength failed her everytime we waded out deep enough to float comfortably. She was unable to lift herself onto the ring while in the water, yet if she sat in at the shore the waves just beached us in a matter of seconds! In the end, after much laughter, we finally devised a plan Dee sat in her ring at the shore while I pulled her out into the deeper water and then when there I would pull myself onto my ring and we would both be floating. However, despite pulling her out as planned every time I went to pull myself onto my floating ring Dee would make me laugh on purpose and I would fail. This went on for a while until through the laughter I finally managed to pull myself up! After that we both floated around for a while fighting against the tide until we found a buoy tied nearby. We quickly tied ourselves to the buoy and there we had it the perfect place. I have no idea how long we stayed out there for but it was perfect, floating in the sunshine as the waves lapped against us with our drinks in our hands. Eventually as it started getting colder we headed for shore and back to our pension to change into warmer and drier clothes for the night ahead. After meeting up with everyone we lost earlier we went to the beach to watch an amazing fireworks display. Fireworks that exploded in the shape of flowers and hearts, fireworks than spiraled and fireworks that tricked down like rain on a window! Amazing! More drink followed and surprise surprise some people started streaking (just to clarify I was not one of those people!). Eventually tiredness won over and I went back to enjoy a nice nights sleep on a hard wooden floor! Next morning, we all had breakfast and then the fun started all over again! 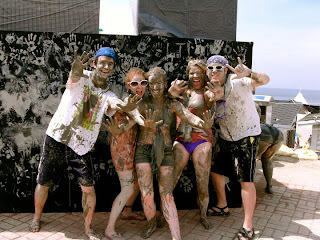 We once more ended up like mud monsters and were posing for a photograph when someone grabbed my arm and pulled me around. I didn't even realise what was going on until a paintbrush of mud hit me!! 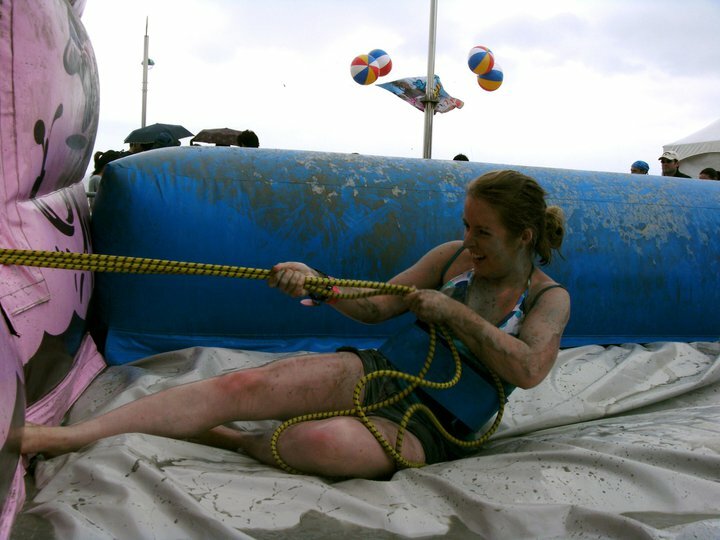 Some Korean woman working there obviously decided I wasn't muddy enough for the photograph and despite all our protests that I was fine she would not leave me go until I was literally covered in mud, she even liberally painted my face, not even my eyelids escaped the mud! 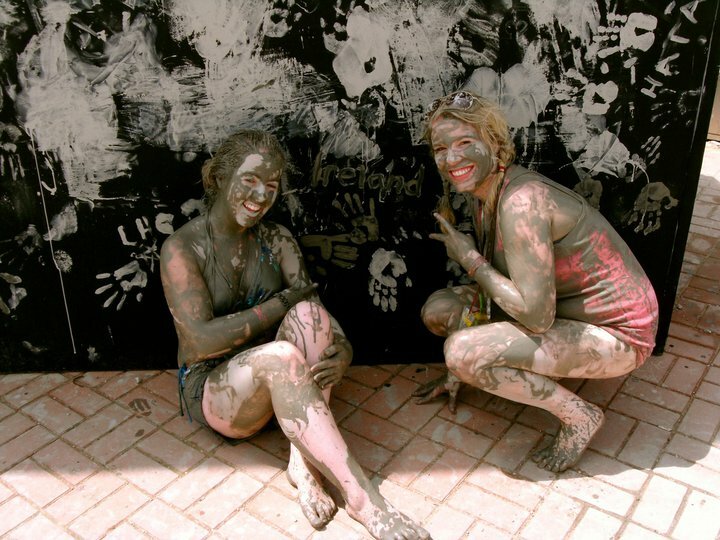 After walking around for a while we decided it was time to get painted with the coloured mud! So after a quick dip in the sea to wash the normal mud off ourselves (which ended up to be not such a quick dip as we played queen's chair, tried to knock each other over, had fights against 2 others while on top of someone's shoulder etc.) 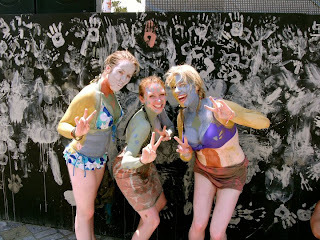 we went and queued for the coloured mud. As Dee, Kyle and Ness all decided exactly how they wanted to be painted I couldn't think of anything in particular I wanted. So when my turn finally came I let the girl painting me use her own initiative and I think I turned out pretty well. 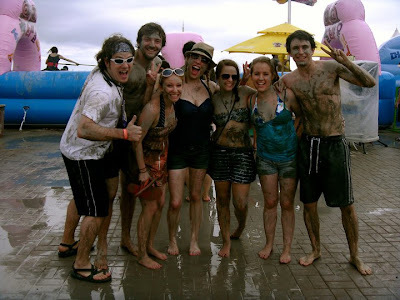 Now with the coloured mud on us I suddenly felt like a celebrity as photographers swarmed around us asking for photos. After posing for a few we decided we had had enough fame for one day and went for a walk along the beach which ended up with Dee and I convincing everyone to rent the inflatable rings once more for the day. Together the five of us, (Kyle, Vanessa, Chris, Dee and I) floated along the shoreline for a while before paddling out a little further. Nessa and I decided that we wanted to jump off a pontoon a little further out so leaving Kyle to hold our floating rings we swam towards the pontoon and after much effort managed to pull ourselves up onto it (I blame Nessa for this. I wanted to swim around to the side with a step up onto it but Ness insisted that both of us had the upper body strength sufficient to pull ourselves up out of the water! Ok in the end she was right and we were able but it was not the easy option that's for sure!). After jumping off once or twice Ness decided to show her skills and dive into the water, I told her I had never learnt to dive and she gave me a quick lesson, which failed miserably, and resulted in me belly-flopping into the water. Thankfully it didn't hurt, in fact, it was hilarious for me as well as everyone watching! We finally decided we had better swim for shore, which seemed easy when we set out, but believe we I was huffing and puffing by the time I arrived at shore dragging my inflatable ring behind me. 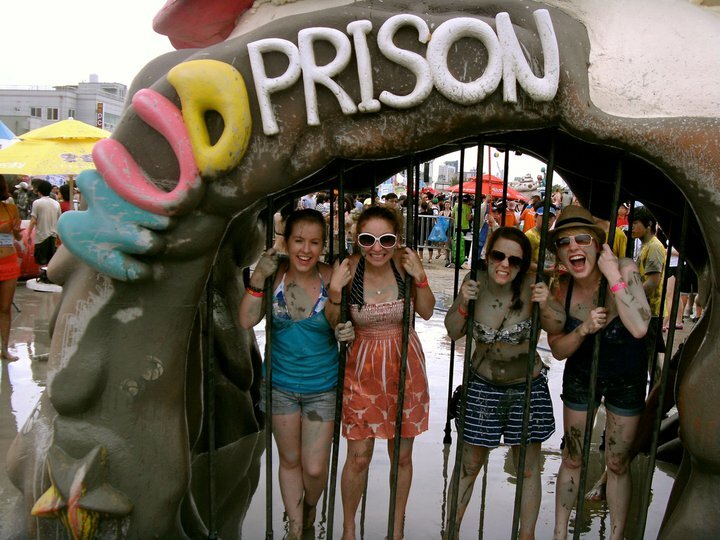 By then it was time to go home and so ended our fantastic weekend at mudfest. To anyone intending to come to Korea or anyone here who has not yet gone... GO TO MUDFEST! You won't regret it!